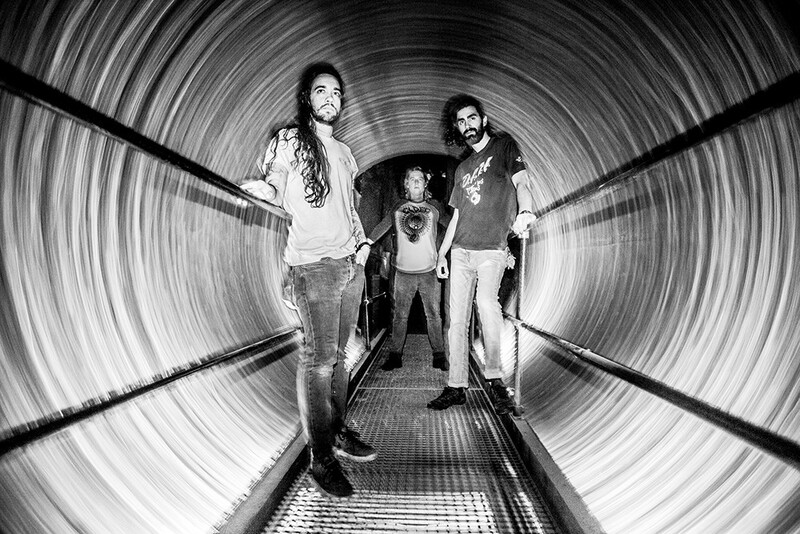 Mellow music meets abrasive riffs in the blues-rock fusion on King Buffalo. As origin stories go, King Buffalo's is... atypical. It starts off normally enough: Two bands in the same town are falling apart. Velvet Elvis has just recorded an album and booked a tour, but when three members split, the other two are left to figure out how to cover the band's obligations. So they recruited two members of crumbling fellow Rochester, New York, act Abandoned Buildings Club. "Me and Dan (Reynolds) had a band that was starting to dwindle, so Scott (Donaldson) asked us if we wanted to go on tour and play some Velvet Elvis songs," says Sean McVay, now the vocalist and guitarist in King Buffalo. "But when we got together to practice, we would just start writing," he continued. "We didn't actually practice any Velvet Elvis songs. So we were like, 'Well, why don't we just be a band?'" That's where the story turns. McVay and Reynolds joined a last-gasp version of Velvet Elvis to play Velvet Elvis songs, but their creative relationship with their new band mates was so fruitful, they became King Buffalo before they could even get that far. It made for a weird tour. "People were like, 'Wait, are you Velvet Elvis or King Buffalo?'" McVay says. "We only ended up learning two Velvet Elvis songs and the rest of the set was new stuff." In other words, a band that no longer existed traveled around the country playing a bunch of songs by a band that didn't quite exist yet. King Buffalo has been chugging along ever since. After the amicable departure of a second guitarist, McVay hunkered down with his bassist, Reynolds, and his drummer, Donaldson, and got to work on what would be their debut full-length, Orion, released in 2015. It was here that King Buffalo began to truly take shape as a rumbling, heavy-lidded psych-blues-rock band with a firm command of dynamics and a healthy appetite for sonic wandering. The latest document of King Buffalo's aptitude and ambition is the band's sophomore effort Longing to Be the Mountain, which they self-released stateside last year. (Stickman Records released it in Europe.) With six tracks stretched across 42 minutes, the album is a study in patient songwriting, spacious recording and welcome growth. "We like our songs to be a blooming journey of sorts," McVay says. "With Longing, I really wanted us to record the softest, most calming, mellow music we had ever done, but then I also wanted to put in some of the biggest, most abrasive riffs we had ever played as well, in the same context. I wanted to get as quiet and as loud as we ever have on one album." Take, for example, "Morning Song," which slowly grows from a warm blanket of acoustic guitar strums into a sinister snarl of guitars in about nine minutes. Or the title track, which mutates a few times, from ambient sound experiment to heavy psychedelic blues to delicate interlude to towering cliff of six-stringed crunch. In "Quickening," an intricately droning guitar part eventually gives way to a savage riff, while the four-minute "Cosmonaut" shimmers and echoes like interstellar indie-pop. Without question, Longing to Be the Mountain is the sound of a band bending and stretching beyond its previous boundaries. And they sound comfortable doing so, especially considering it wasn't exactly comfortable at the time. "We definitely were trying to push ourselves into new sounds and new structures. It was actually really scary," McVay says. "I remember (we got the final mixes back) when we were on tour, so we listened to them in the van and I was terrified. I was like, 'Oh my god, are the people that like us going to hate this record?' It was a really scary moment." People didn't hate it. Quite the opposite, in fact: The band grew its audience significantly in 2018 (opening for the Sword on tour didn't hurt) and positive reviews poured in from prominent rock websites like the Obelisk, Heavy Blog is Heavy and Echoes and Dust, which called King Buffalo "a band poised on the edge of greatness." For McVay and his band mates, that's just more evidence that sometimes straying from the path is necessary, even for a band on the rise. The original print version of this article was headlined "All About the Journey"